You’ve no doubt heard about the Onion kerfuffle that happened yesterday. They did an article about Congress holding kids ransom and “livetweeted” developments in realtime, and the Capitol police had to be called because people are stupid. Most of the uproar stemmed from the first tweet, which simply said “BREAKING: Witnesses reporting screams and gunfire heard inside Capitol building.” Some people, including Chris Hayes, thought The Onion had been hacked; others apparently thought it was real. Michelle Malkin didn’t think it was funny because it made light of a serious issue (“Maybe if some of these humorists had relatives who worked in the Capitol they would have thought twice”), while one of the people in the comments said it was “equivalent to yelling ‘fire’ in a crowded theater.” Xeni Jardin of Boing Boing called the tweet “troublesome” because it didn’t contain any “subtle indicators” of jokes like hashtags or links to longer comedy pieces, and insisted the joke had backfired (if her criteria for a backfired joke is “people fell for it,” then every Onion article has “backfired”). 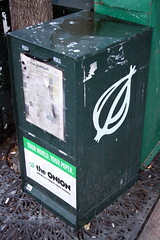 Apparently people are calling it a #TWITTERFAIL (I involuntarily shuddered as I typed that) for The Onion. It reminds me of the insane overreaction to that great New Yorker cover satirizing Barack Obama conspiracy theories. I barely remember what the reasoning behind the overreaction was, something about how it wasn’t clear it was a joke (obviously people should start putting JOKE ALERTS on jokes). In any case, pundits should stop playing Comedy Cops unless they have a degree from an accredited clown college.